Home » Christmas » Doha’s Christmas Dinners and all those festive New Years events! The festive season is almost upon us, and for those of you celebrating Christmas in Doha you’re going to be spoilt for choice this year. There are plenty of festive events, from Xmas Afternoon Teas and Gingerbread House Decorating Classes, to Christmas Tree Lighting Celebrations and Festive Dinners & Brunches! You may find that some venues have waiting lists for their Xmas Day Brunches or Dinners, but there will be plenty of new Xmas offers added to this listing as the season gets going so do keep checking back for more events. And because we are nice, we have also added events to help you to celebrate New Year celebrations too! 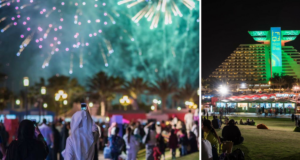 So whether you’ve been naughty or nice take a look at what’s happening during the festive season in Qatar. WHAT: The children will get hands-on during this workshop by the Pastry Chef. With everything your little cherubs will need to build and decorate a gingerbread house. WHEN: 20th-23rd December 2017, 10:00am-12:00pm noon. PRICE: QAR 180 per participating child. Advance Payment Required. WHAT: Decorating a gingerbread house with the family. WHEN: 23rd December 2017, 2:00pm-6:00pm. PRICE: QAR 199 per house. Advance booking required. BOOKINGS: For more information call +974 4445 5535 | 4445 5555. WHAT: Family-friendly activity to decorate gingerbread houses. BOOKINGS: For more information call +974 4445 5535 |4445 5555. WHAT: Children’s cooking class to learn how to make Ravioli pasta. PRICE: FREE – only for children aged 5 to 12 years. *Every child should be accompanied by an adult. Advance booking required. WHAT: Children’s workshop to decorate their own gingerbread man. PRICE: QAR 75 per gingerbread man. WHAT: Christmas Tree Lighting Ceremony in the lobby with Xmas carols and signature eggnog and festive delights. WHAT: Christmas Tree Lighting Ceremony in the lobby. BOOKINGS: No need to book. For more information call +974 4446 0000 or email [email protected]. WHAT: Christmas gingerbread house decorating activity for the children and family. Each gingerbread house comes with icing and sweet treats. Prior booking is required. PRICE: QAR 125 per house. WHAT: Build your Christmas Gingerbread House for the perfect seasonal centrepiece. Guests will also learn candy cocktail making, and enjoy some light refreshments. WHEN: Daily from 16th until 21st December 2017 at 10:00am. PRICE: QAR 200 per house. Advance booking required. WHAT: Enjoy Friday brunch while the kids decorate a festive gingerbread masterpiece. WHEN: Available every Friday throughout December from 12:30pm to 4:00pm. 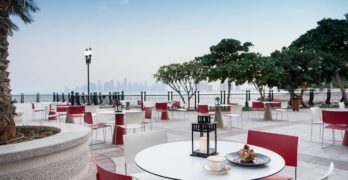 PRICE: Price as per Friday Brunch – QAR 305 with soft drinks | QAR 405 with selected beverages. BOOKINGS: For more information call +974 4429 5295 or email [email protected]. BOOKINGS: For more information call +974 4446 0000 or email [email protected]. PRICE: QAR 185 per adult. QAR 90 per child aged 6-12years. WHAT: Afternoon tea Buffet with finger sandwiches, mince pies and cake. And the children can have a picture with Santa and decorate gingerbread houses and cookies with the help of the Kempinski bakers. WHAT: A traditional Afternoon Tea experience with a festive twist. WHAT: Festive Afternoon Tea experience with savouries & sweets. 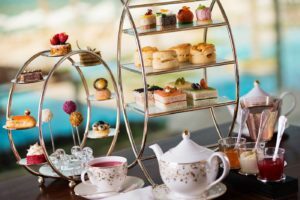 WHAT: Sip and savour the sweetest holiday treats at with a festive Afternoon Tea that includes sweet and savoury bites, and a choice of hot or cold beverage. BOOKINGS: +974 4494 8600 or email [email protected]. WHAT: Its a festive twist to the classic Ritz Afternoon Tea. WHEN: Daily from 15th until 30th December 2017; 2:30pm – 5:00pm. WHAT: Children can enjoy decorating freshly baked cookies and gingerbread man and have their picture taken with Santa Claus. WHAT: Afternoon Tea menu with international treats inc. Italian panettone, British Xmas pudding, and Austrian Yule Log. For Turkey To Go Options check out our special feature: Are You Looking for a Turkey To Go This Festive Season? Are You Looking for a Turkey To Go This Festive Season? WHAT: Christmas Eve Dinner Buffet with festive and International specialties, features violin music. WHAT: Christmas Eve Dinner Buffet with 5 course set menu. PRICE: QR450 with food only | QR750 with enhanced beverages. WHAT: Christmas Eve Dinner Buffet with traditional menu and house band. WHAT: Christmas Eve Dinner with 4 course set menu. WHAT: Christmas Eve Dinner Buffet featuring Doha Jazz band. WHAT: Christmas Eve Dinner with 4 course menu. PRICE: QAR 320 | QAR 420 with enhanced beverages. PRICE: QAR 295 | QAR 475 with Sommelier’s selection | *A la carte menu also available. WHAT: Christmas Eve Buffet Dinner with live band. WHAT: Nochebuena Christmas Eve Dinner celebration at El Faro with family-style sharing menu. WHAT: Christmas Eve Dinner with set menu. WHAT: Christmas Eve Dinner with Chef Emanuele’s Italian 4-course set menu. PRICE: From QAR 329 per person. WHAT: Enjoy Xmas Eve Dinner Set Menus (or a la carte) at Shangri-La’s restaurants. DETAILS: Fuego restaurant: Dinner 5:30pm to 12:00am midnight. 3 course set menu priced from QAR 260 per person. *A la carte menu available. Shanghai Club: A la carte dinner menu from 7:30pm-11:30pm. WHAT: Christmas Eve Dinner with 4 course set menu. Features live band. PRICE: QAR 250 per person | QAR 395 per person with house beverages. WHAT: 4-course holiday set menu on Christmas Eve with amuse bouche. PRICE: QAR 410 inc non-alcoholic beverages. Kids aged 11 and below receive complimentary meal from the kids menu. BOOKING: +974 4494 8600 or email [email protected]. WHEN: Sunday 24th December 2017, 7:00pm-12:00am. PRICE: QAR 180 per person | QAR 300 per couple. BOOKINGS: For more information call +974 4445 5535. WHAT: Christmas Eve Dinner Buffet with turkey & trimmings, roast beef, and festive international treats. PRICE: From QAR 265 with soft drinks. Below 6 years are free; children aged 6-12 get 50% off. WHEN: Sunday 24th December 2017; 6:30pm – 10:30pm. WHAT: Xmas Eve Dinner with seasonal dishes and Gluehwein beverage. WHEN: Sunday 24th December 2017; 6:30pm – 11:00pm. WHAT: Xmas Eve Set 4 course Menu with live entertainment. WHEN: Sunday 24th December 2017; 7:00pm – 12:00pm. PRICE: QAR 360 per person (beverages not included). WHAT: Xmas Eve Khontok Set Menu plus complimentary Thai gift to take away with you. PRICE: QAR 320 per person. WHAT: Christmas Day menu featuring Turkey Breast with sides, and Buche Noel. PRICE: QAR 220 per person. WHAT: Christmas Day Lunch with festive food and visit from special guest! WHAT: Christmas Day Brunch with live cooking stations and a surprise visit with gifts for every child. WHAT: Christmas Day Brunch with live cooking stations inc roast turkey, and Santa Claus visit. Features kids play area. WHAT: Christmas Day Feliz Natal featuring Brazilian band. WHAT: Christmas Day Big Apple Brunch with roast turkey carving trolley, and new specials. PRICE: QAR 500 with soft drinks | QAR 650 with enhanced beverages. WHAT: Enjoy Xmas Day Brunch or Dinner at Shangri-La’s restaurants. DETAILS: Shangtastic Brunch from 1:00pm-5:00pm, priced at QAR 305 with soft drinks and QAR 405 with house beverages. Fuego restaurant: Dinner 5:30pm to 12:00am midnight. A la carte menu available. WHAT: Christmas Day Brunch Dinner Buffet with traditional menu, DJ & house band. Featuring visit from Santa Claus. PRICE: QAR 299 with soft drinks | QAR 449 with special beverages. WHAT: Christmas Day Brunch Buffet featuring Doha Jazz band. WHAT: Christmas Day Brunch with live music. PRICE: QR350 with food only | QR450 with enhanced beverages. WHAT: Christmas Day Brunch with Kids mini-corner and house band. WHAT: Christmas Day sharing-style Brunch. WHAT: Christmas Day Brunch Buffet with festive spirit, featuring face painting, bouncy castle, and Santa visit. Live entertainment. WHAT: Traditional holiday Christmas Day Brunch with holiday favourites and international offerings across 4 restaurants. Also festive activities for the children. PRICE: QAR 550 per person. Kids Christmas Brunch priced at QAR 275 per child for ages 5-12. WHAT: Enjoy Christmas Day Brunch at Al Liwan which will be transformed into an elegant wonderland (featuring live entertainment). WHAT: Xmas Day Brunch with live entertainment by Cuban Band. WHAT: Christmas Day Brunch Buffet with Italian classic, and International favourites. WHAT: Christmas Day Brunch Buffet with live entertainment. PRICE: From QAR 315 with soft drinks. Below 6 years are free; children aged 6-12 get 50% off. WHAT: Christmas Day Brunch with festive decoration, kids activities, and live music. Special visit from Santa Claus. WHEN: Monday 25th December 2017; 12:30pm – 4:00pm. WHAT: Xmas Day Brunch with kid’s corner and games. WHAT: Xmas Day Bubbalicious Festive Brunch, with something special for the children. PRICE: QAR 430 per person. WHAT: Boxing Day Lunch Buffet with signature dishes including sushi, Peking duck and live noodle station. PRICE: QAR 200 per person. WHAT: New Year’s Eve 5 course menu with live entertainment. WHAT: New Year’s Eve Brazilian Buffet with live entertainment. WHAT: New Year’s Eve festive celebration. WHAT: New Year’s Eve Dinner with 4 course menu. WHAT: New Year’s Eve celebration. WHAT: New Year’s Eve Dinner with authentic Lebanese set menu. WHAT: New Year’s Eve Dinner Menu by Chef Emanuele with Italian and International dishes. PRICE: From QAR 399 per person. WHAT: New Year’s Eve Celebration with food, beverages and live DJ. PRICE: From QAR 220 per person. WHAT: New Year’s Eve Dinner with 5 course set menu with live music. PRICE: QR465 with food only | QR695 with enhanced beverages. *Guests who book at CUT or Morimoto will also have the option to buy the Black Orchid Bold Package for an additional QR 450 per person that extends the New Year celebrations to Black Orchid nightclub, which includes live entertainment, DJ, and exciting drinks to ring in the New Year. WHAT: New Year’s Eve Dinner with 6 course set menu with live DJ. PRICE: QR550 with food only | QR750 with enhanced beverages. *Hudson Tavern and RISE venues will both offer an open bar on New Year at QAR 350 per person. Black Orchid will also be open on the night with prices starting from QAR 500 (membership required). WHAT: New Year’s Eve Spanish-style celebration. 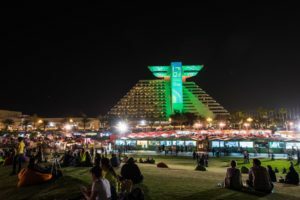 WHAT: Thai New Year’s Eve Night Market with live cooking stations and house band. WHAT: SMBC Route 66 NYE Californian Throwdown with live cooking stations, entertainment and house band. WHAT: New Year’s Eve Dinner with International cuisine. PRICE: From QAR 395. *Complimentary ticket to the Bash on the Bridge included. WHAT: Enjoy a Sky High New Year’s Eve with city views form the 55th and 56th floors of Intercontinental Doha The City. PRICE: QAR 355| Entrance only is QAR 100 per person. *Guests must be 21 years old and above – Qatar ID/ passport required. WHAT: New Year’s Eve celebration with a special set menu of Arabian favourites. PRICE: From QAR 325. Guests must be 21 years old and above. *Complimentary ticket to the Bash on the Bridge included. WHAT: New Year’s Eve party with live entertainment, DJ and midnight balloon drop. WHAT: Great Gatsby-style New Year’s Eve Dinner celebration at Prime restaurant. Set menu with signature chocolate sphere dessert; features live music. PRICE: From QAR 390. *Complimentary ticket to the Bash on the Bridge included. WHEN: Sunday 31st December 7:00pm until 2:00am. PRICE: QAR 465 per person for 5 course set menu | QAR 695 per person for 5 course set menu & unlimited selected sips. WHAT:An authentic Capodano to welcome in New Year with live music by the soul singers Gigi McFarlane & The Boys. WHAT: New Year’s Eve with live music by singer Megan McConnell. WHAT: All That Glitters Gala Dinner with 5 courses, and glass of bubbly to ring in the New Year 2018. With live 12 piece band from London. WHEN: Sunday 31st December 8:00pm until late. WHAT: Caribbean New Years Eve Dinner Celebration with 5 course menu and live band. WHEN: Sunday 31st December 2017; 8:00pm – 12:00pm. WHAT: New Year’s Eve Dinner with 5 course set menu. WHAT: New Year’s Eve celebration with DJ Jay Psar. *Diners have free access to the Lounge (table is not guaranteed). WHAT: New Year’s Eve celebration with live DJ and New Year countdown. WHAT: New Year’s Eve Buffet with live band and New Year countdown. WHAT: New York-syle New Year’s Eve celebration with 5 course dinner and DJ. WHAT: New Year’s Eve Brunch across Astor Grill, Opal by Gordon Ramsay, Vine and more – features DJ. PRICE: QAR 555 with soft drinks | QAR 655 with enhanced beverages. WHAT: New Year’s Eve celebration with a la carte menu. WHAT: New Year’s Eve Diner with 5 course menu and live DJ. WHAT: New Year’s Eve Buffet with festive decorations and live band. WHAT: New Year’s Eve celebration with traditional Spanish family style sharing menu. WHAT: Latin American New Year’s Eve celebration with set menu featuring Rodizio. WHAT: New Year’s Eve Dinner featuring Persian dishes, and live entertianment. WHAT: New Year’s Eve Dinner Buffet with live entertainment. WHAT: New Year’s Eve Countdown with live entertainment, DJ and midnight toast. WHEN: Sunday 31st December 2017; 7:00pm – 2:00am. WHAT: New Year’s Eve Dinner with à la carte menu combined with traditional Italian cuisine. WHEN: Sunday 31st December 2017; 7:00pm – 1:00am. PRICE: QAR 480 per person. Advance reservation required. WHAT: New Year’s Eve Dinner with 6 course set menu. WHAT: New Year’s Eve celebration with DJ Melody. PRICE: Tickets at the door on 31st evening – price from QAR 50. WHEN: Sunday 31st December 2017, 7:00pm-12:00am. PRICE: QAR 220 per person | QAR 400 per couple. WHEN: Sunday 31st December 7:00pm until 11:00pm. WHAT: New Year’s Eve Thai-style sharing menu, plus entertainment. WHAT: Bubbalicious New Year’s Eve, with entertainment. WHAT: Winter Wonderland New Year’s Eve Dinner Party, featuring live cooking stations and live entertainment. New Year’s countdown will be along the private Four Seasons beach. PRICE: From QAR 600 per person. WHAT: New Year’s Eve 7-course menu inc caviar, Alaskan King Crab and Nobu sushi selection. PRICE: From QAR 700 per person. WHAT: New Year’s Day Brunch, with International and regional cuisine in a festive atmosphere. WHAT: New Year’s Day Brunch with live cooking stations. WHAT: New Year’s Day with live performance by singer Megan McConnell. WHEN: Monday 1st January 2018 12:00pm until 4:00pm. WHAT: New Year’s Day Brunch with live music. WHAT: New Year’s Day Lunch Buffet featuring Arabic and Asian cuisine. PRICE: From QAR 200 per person. WHAT: New Year’s Day Brunch with live band. WHEN: Monday 1st January 2018; 12:30pm – 4:00pm. WHAT: New Year’s Day Brunch Buffet with international offerings. WHAT: Enjoy New Year’s Day Dinner at Shangri-La’s restaurants. DETAILS: Shangtastic Dinner at Fuego & Santorini from 8:30pm-12:30am, priced at QAR 400 with soft drinks and QAR 650 with house beverages. Sridan restaurant: Dinner 6:30pm to 10:30pm priced at QAR 285 with soft drinks and QAR 385 with house beverages. Shanghai Club: 8 courser set dinner menu from 7:30pm-11:30pm, priced at QAR 488 per person.